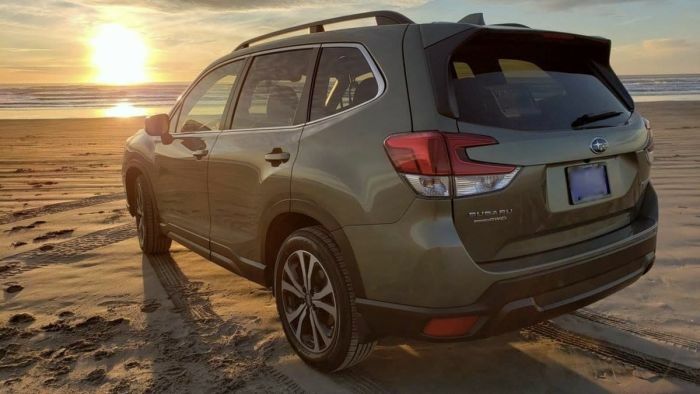 When Subaru uncovered the all-new 2019 Forester, they disappointed Subaru enthusiasts when they dropped the Forester 2.0XT turbo model. They were also surprised that the Japanese automaker ditched the 6-speed manual gearbox option on the new fifth-generation SUV. Even though sales of those two models were slow and one of the main reasons for jettisoning both trims, there are other reasons why Subaru Corporation did away with them. The new Mazda CX-5 gets the nod as the #1 compact SUV in the crowded segment by Car and Driver. They lauded the CX-5 for its newly-available 250-hp turbocharged engine upgrade. This is similar to the 250-hp 2.0XT Forester model Subaru just discontinued. Did Subaru make a mistake dropping the sporty 2.0XT trim? Subaru believes expressing sportiness in the Forester is more about synergy and how the engine responds to driver inputs and its overall driving dynamics. “There is a way to express the sportiness of the SUV, and that’s what we think we have accomplished with the new Forester. We have prepared a different type of engine, not just the 2.0-liter that we’re launching this time. But regardless of engine displacement, we focused on engine response, it’s the key thing we focused on,” says Ishitobi. One of Subaru’s core values is safety, and they won’t compromise it for anything. Subaru ditched the 6-speed manual rower because they made their EyeSight driver assist system standard across all Forester trims, as it’s incompatible with a manual gearbox. The Japanese automaker also says they picked up new customers who had never purchased a Subaru vehicle before because of the EyeSight safety feature. Customers will see all SUV models in their lineup come with EyeSight soon. If you look at the glass half full, the all-new 2019 Subaru Forester did score ahead of 10 compact SUVs on the long list of sixteen contenders from Car and Driver. We are wondering if Forester would have been in the top three if they still had the Forester 2.0XT turbocharged model. Mazda moves ahead of the pack with their new 2.5T 250-hp 310 lb-ft of torque sporty CX-5. Subaru's pandering to the "non-GMO, free range, anti-vac, gluten free, artisanal, Fair Trade, vegan, bunny huggers is a disservice to the GREAT cars that they have. My wife has a 2015 Forester XT. That motor is fantastic!!! In the Cut & Thrust driving in the NY metro area, it prevents accidents! So short sighted of Subaru. They make some nice cars, and then underpower too many of them, especially the Crosstrek, BRZ and the Forester. I am not sure why they won't address these shortcomings, but until they do I will not be purchasing their vehicles, that I otherwise would. It is too bad that the compact crossover segment that is otherwise selling well has such mediocre engine choices unless you jump up to the luxury segment among the Japanese offerings. I owned 3 XT based Foresters since the early 2000's and I enjoyed them very much. Especially when going to the mountains. In 2020 I plan to replace my 2014 Forester XT with a 2020 or 2021 model, and if Subaru does not make a Forester XT in 2020 or 2021 model then will have to say ADIOS SUBARU after owning 5 Subarus since 1988. Pretty stupid decision on Subaru's management to drop it in favor of the Outback which reminds me of my grandfather station wagon despite all its advertised improvements in 2020. I had a brand new 2019 Touring for two weeks while my 16 XT was in the shop. It's SLOW. There is almost zero passing power, and merging is painful. I had to turn the eyesight off because it got confused with an offramp single land that split into three lanes - It thought I wanted the middle land, but there was already a car there and it tried to "lane assist" me into the vehicle next to me. I have no idea how they are allowed to put eyesights in these things. They're extremely dangerous, IMO.